I’ve lived in Southern California all my life. So you would think that I might have driven a few hours south to go party it up at Tiajuana or something. Nope. Never ever in my entire life have I crossed an international border! Kind of sad, if you think about it… all the different regional foods I’m missing out on. I rarely even go out of California! 🙁 Time for a road trip! The California Roll is arguably one of the most popular types of sushi known to man. Both fish-lovers and people who are more than a little “ick” at the thought of eating raw fish love the California Roll. But if that’s the only type of roll you like, eating it all the time can get an itty bit boring. Taking the flavor a little bit south and adding Sriracha sauce to the roll really livens it up, and may just be my new favorite way to eat California Rolls! 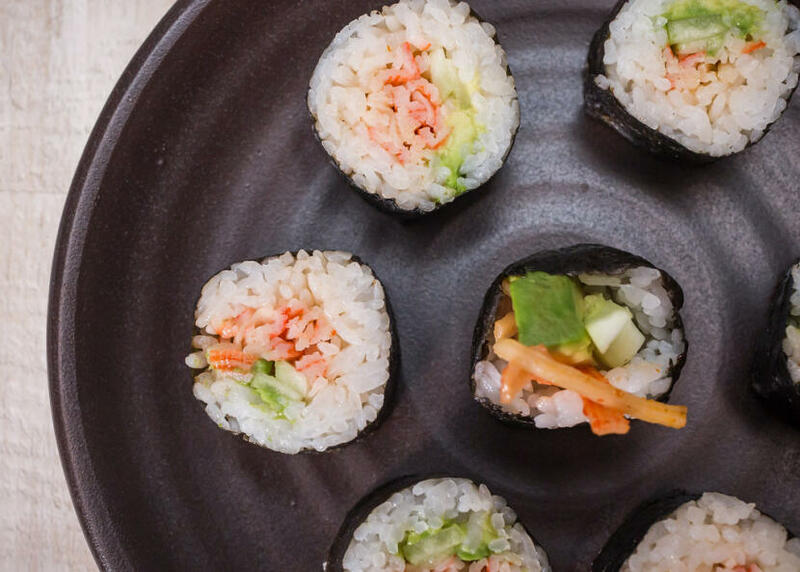 Or, if you want a different twist to your California Roll, you can try one of the four other types of California Rolls I have on Sushi Day: the New Zealand Roll, the American Roll, the Crazy California Roll and the Super California Roll. Mix the imitation crab, mayonnaise and Sriracha sauce. 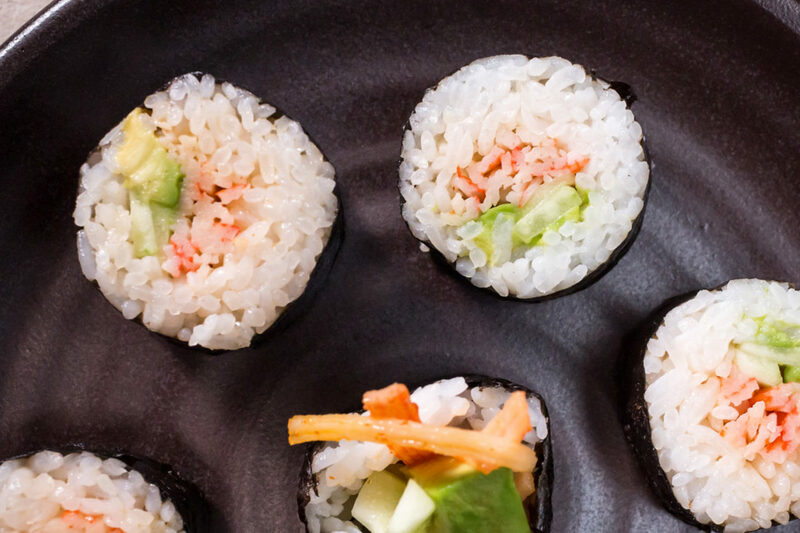 Roll the sushi, using the imitation crab mix, avocado and cucumber as your fillings. This sounds like a seriously tasty roll, I think we’ll have to try it out (after the hit that was your mac ‘n cheese, I’m sure all of your recipes will do well with our gang). Oh,Sushi! I am interested in the food culture of your country so that you are so. You last comment on my blog has me craving for sushi and sashimi. We actually have some sushi in town (some asians who run the video store make it on the side). Except (typical to this town), you cant’ buy it after 4:15 PM (and everyone gets off work at 4:30). I was once on a boat tour in Australia, and the captain landed a small tuna, and we had sashimi on the spot. You cant’ get any fresher than that. The best restaurant sushi I ever had was in Vancouver. They have tons of places…all-you-can-eat for 25$. It wasn’t cheap buffet sushi , either..it was the good quality stuff. I was in heaven. I ate and ate and ate…the manager was so impressed he kept coming to my table and kept suggesting other dishes I should try. They musta lost a ton of money on me…but it was the best sushi I had in my life. Friar – Gosh, and I thought everything closing at 9 here was bad! Mmm that certainly is extremely fresh, and must have been tasty! Really, all you can eat! Oh man that sounds good! Especially when it’s more than just California rolls! Melissa – That’s good to hear! 🙂 I’m very glad to hear that I’ve moved you to want to cook and make sushi more. 🙂 Let me know if you make any of my recipes, and how you like them! I want to try this recipe, sounds delicious! Great recipe. I will try it at my next party. I can get all the items really cheap and available widely here in Thailand. Nice tutorial… just exactly what I was looking for. Thanks.